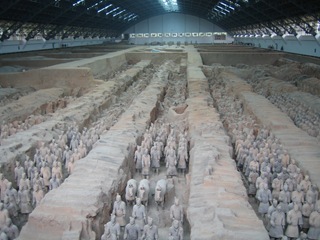 Over the past several months, The High Museum of Art Atlanta has been advertising a display of China's Terracotta Army. I guess I'm not well enough read, as I was unaware of what many call the 20th century's most significant archeological find. This is not to say I am completely uncultured, however. Hey, I've seen "The Mummy - Tomb of the Dragon Emperor." (There was no benefit to writing a review. You know what you're getting when you decide to watch it). 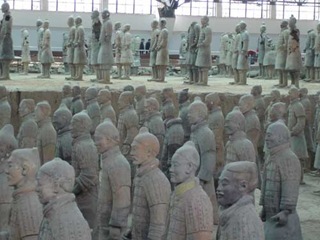 Anyway, you want Terracotta warriors? You can see them in (computer generated) action! But if not for the High's advertising, I don't know necessarily that I would have assumed such things to actually exist. Well, they do, and 20 of them, plus or minus some (at times, significant) pieces, are here in Atlanta. In short, China's first emperor spent much of his life pursuing eternal life (as such becomes Emperors) and the planning of his burial palace. A man of his position certainly deserves an after-life of full proportions, so he made himself an entombed army to command. And government clerks. And entertainers. And selected wildlife. All of which were, ~220 - 206 B.C., manufactured in an assembly line process. 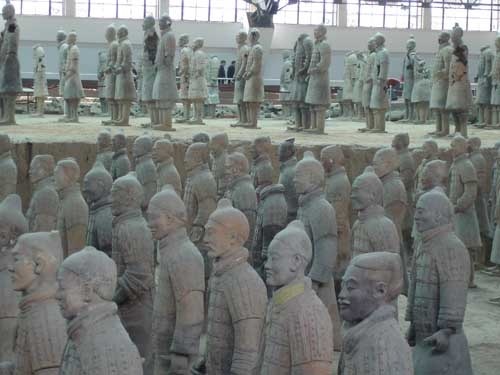 Most of the pieces were made from common molds, but each of the estimated 8,000 soldiers' faces were individually carved before firing. There are no two alike. The presentation included an audio tour and descriptive information. The detail on these is incredible, from treaded shoes to the braids of hair. Each originally held brass weapons, many of which were looted about 5 years after the eternally living Emperor died. There's plenty to read on the subject if you search for it. A few thoughts on it. Had it not been indicated in a small explanatory panel, the soldiers presented on display might suggest that all of them were without color. In fact, dyes were used to color each, apparently vibrantly, from head to foot. A picture of several in China shows only a hint of this, as they've faded through the years. Note the horses in the middle column. Amazing stuff. Aside from the assembly line approach to manufacturing these, there were two other facts I found interesting. One was that in these underground tombs, the emperor re-routed at least one river, so that the terracotta birds could drink. There are some historical records of rivers of mercury, and high levels have been detected at the emperor's own tomb site, which as yet remains untouched. 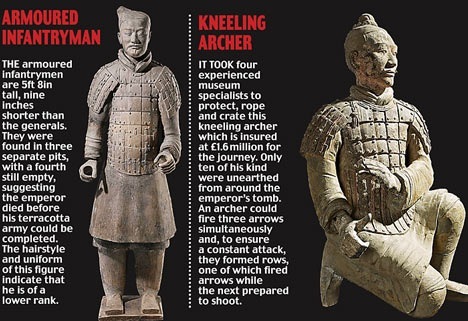 Secondly was the trigger mechanism of their crossbows. These were made of three pieces of cast metal, and they were easily interchangeable should a part become damaged, obviously very beneficial in field combat. Their quality control over their parts manufacturing was very exacting, and for all things made, failure to meet expectations often resulted in death. Some things haven't changed, regarding which I am not casting stones. Being cultured... sometimes it can be interesting and enjoyable! Anyway, a concluding video.